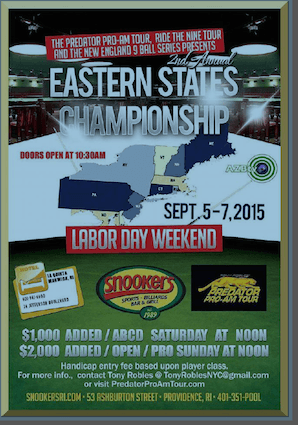 The Predator Pro/AM Tour sponsored by Predator Cues and co-sponsored by Ozone Billiards, Delta-13 & the National Amateur Pool League, joined forces with SNOOKERS & MD Promotions NE 9 Ball Series Gloria Jean’s Ride The Nine Tour to bring you the 2nd Annual EASTERN STATES CHAMPIONSHIP this weekend, Sept 5th thru 7th at Snookers Billiards Sports Bar & Grill in Providence, R.I. The Amateur event will start on Saturday around Noon and is limited to 128 players and will end on Monday, September 7th which is Labor Day. The Amateur Event is a $1,000 Added Event. The $2,000 Added Open/Pro Event will start on Sunday around 11am and is limited to 64 players and will also finish on Monday.